If your order weighs less than 13 ounces, save huge on shipping with USPS first class (with tracking number). This product weighs 2 oz. 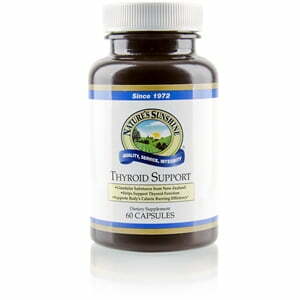 Nature’s Sunshine Thyroid Support combines nutrients and herbs essential to thyroid health and thyroid hormone action. The thyroid and the hormones it produces play a key role in many bodily functions. It regulates oxygen use, basal metabolic rate, cellular metabolism, growth and development, and body temperature. Thyroid Support capsules contain a specially formulated blend of l-tyrosine, kelp, zinc, copper citrate, pyridoxal-5-phosphate, protease, stinging nettle, and manganese. The formula also includes thyroid and brain glandular substances taken from certified BSE-free New Zealand cattle.